Yellow archangel bears bright flowers and pretty leaves. Tolerant of a number of challenging conditions, it gives us plenty of reasons to grow it, at first glance. However, a deeper dive into this plant's traits reveals possible reasons why you may not want to grow it. Plant taxonomy formerly classified yellow archangel plants as Lamium galeobdolon. The newer botanical name now in use is Lamiastrum galeobdolon. The latter conveniently draws a distinction between yellow archangel and true Lamium plants ("deadnettle"), such as Lamium maculatum Purple Dragon or White Nancy. The name, Lamiastrum indicates that yellow archangel is a "false" Lamium plant or merely resembles a true Lamium plant. Nevertheless,​ the yellow archangel is commonly referred to as simply a "yellow lamium " or "yellow deadnettle." But do not confuse it with "stinging nettle" (Urtica). Despite the similarity in common names, for most people, there is no reason to avoid contact with yellow deadnettle, as you would with stinging nettle. The latter is a widespread garden weed. As its name suggests, contact with stinging nettle can cause a painful, burning rash. The primary common name for this plant alludes to the color of the flowers and to the appearance of the leaves. Apparently, whoever originally named it was struck by how the tapered leaves of the species plant and of some cultivars resembled wings. Yellow archangel plants are herbaceous perennials. Some cultivars of this member of the mint family may be evergreen or semi-evergreen in warm regions. Generally reaching about 1 to 2 feet in height, the spread of yellow archangel plants will depend on the cultivar. Hermann's Pride will spread to a width of only about 1 foot, meaning it is the preferred yellow deadnettle for a perennial bed. Other types, while perhaps desirable where an aggressive ground cover is called for, are not at all suitable for planting beds because they spread too freely, quickly forming a mat. Yellow archangel plants produce tube-shaped, yellow flowers in mid-spring or in late spring, depending on where you live. But these shade plants are grown just as much for their foliage. Their leaves give off a minty fragrance when crushed. The species plant has plain green leaves, but the cultivars sold at garden centers bear more attractive variegated leaves. Yellow archangel plants are best grown in planting zones 4 to 8. This yellow-flowering perennial is indigenous to Europe and western Asia. Grow the plants in partial shade to full shade and in a well-drained loam, enriched with compost. Although a moderately drought-tolerant ground cover when mature and if grown in sufficient shade, young plants require an evenly moist soil. The aggressively spreading cultivars are used as ground covers, particularly in shade gardens. In out-of-the-way woodland gardens, their spreading habit may be more tolerable than elsewhere, or even desirable. Examples are Variegata, Silver Frost, and Jade Frost. All three bear leaves that have silver flecks and that are more heart-shaped than those of Hermann's Pride. While you are waiting for them to take over a patch of shady land as a ground cover, fill the spaces in between your yellow archangel plants with red impatiens to create a colorful summertime display. These perennials are invasive plants in many cases. They can aggressively root via stolons wherever they touch the earth. Check with your local county extension regarding the advisability of growing them in your region (be prepared to cite the cultivar name, if any, of the plant that you are considering growing when you contact the extension agent). Hack back yellow archangel plants when they become leggy to promote a more compact form. You can divide these perennials either in fall or in early spring. 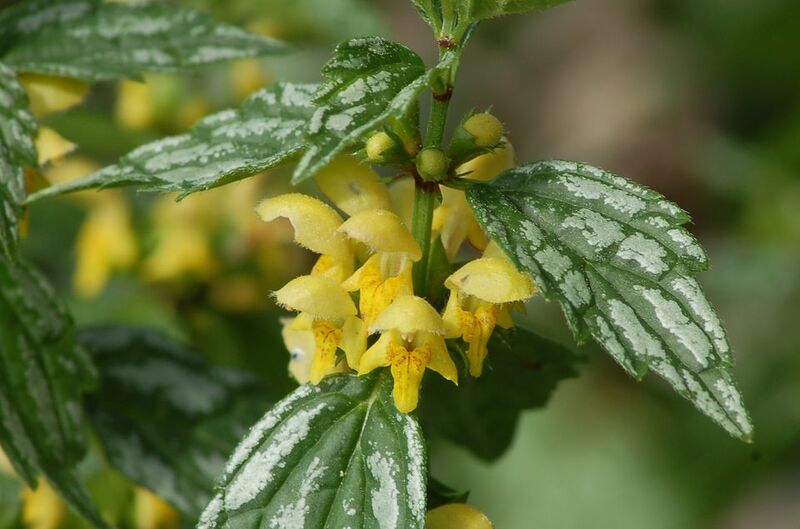 Yellow archangel plants are valued for their tolerance of shady conditions. With their green and silver foliage, they can brighten up a shady area even when not in bloom. These perennials are also deer-resistant.